November is such a busy month and because of that you will notice that we do not have as many classes on our schedule. But just because we don’t have as many classes doesn’t mean we don’t want to see you. Most of you know that we are not open the day after Thanksgiving. Because of our location we have found that most people do not want to fight the traffic to come to our shop that day. We will be open on the Saturday after Thanksgiving. So this year we thought we would have our own Pre-Black Friday Event 1 week ahead of time. So we hope you will join us for our first ever Pre-Black Friday Event. On Friday November 18th from 4-8 pm we will be getting a jump start on the holiday season. On this one evening we will be giving demos on all the machines including the all new 580E. Try out the Bernina 820 on the Bernina quilt frame. See our new products with one time savings. Take time from your shopping for refreshments. 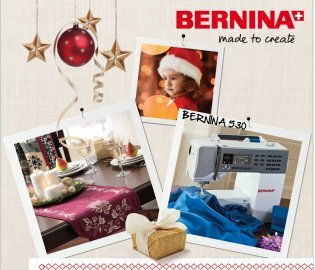 Pick up the Bernina 2011 Holiday Catalog that is loaded with special machine and software pricing. Take advantage of the 25% off coupon and receive an extra 5% off during our 4 hour sale. Register to win a Bernette 46 and other gifts. All of our machines are priced to make this a truly memorable holiday season. Stop in and pick up the Bernina 2011 Holiday Catalog now. 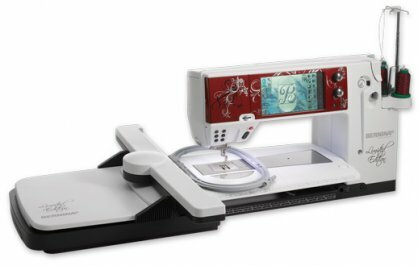 Bernina is allowing us to bundle the Bernina 830LE, that you receive a free jumbo hoop or bernette 46 with from Bernina, along with your choice of the Bernina V6 DesignerPlus Software, Bernina Table, Quilt Frame and QuiltMotion Software. The Savings on the software, table and frame are up to 60% off MSRP. This is a great time to get any or all of these items at a great saving when you purchase the Bernina 830LE. As a reminder for those of you have Design Connection CD’s left to be burned in Embroidery Take Out. You only have until December 22nd to bring in your CD’s and pick out design to put on them. After the end of the year we will no longer have Design Connection. If you have not had your CD’s burned you will loose them and there is no refund for them. We will still be able to sell you single designs and design pack but the will be put on your own USB stick. We do have generic USB sticks in the store for you to buy. Just bring in you stick, pick out a design and we will put it on for you. What could be simpler? Our last Embroidery Club of the year is on Saturday November 19th at 9:30. We also have our last Club of the Year on December 3rd. It is our annual Pot-Luck Brunch. We always have a good time and have great food too. Don’t forget to look at our class calendar for upcoming classes and for shop closings and special hours.